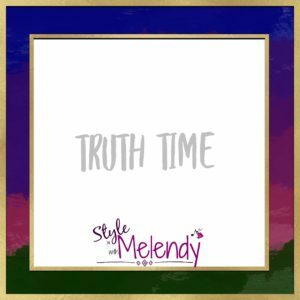 Truth time – The Real me needs some work. I am confident that I am not 100% happy with my body – heck who is?! If we were all confident in our bodies gym’s wouldn’t exist! I am confident that I am working hard on that – As hard as I can want to. We all have areas where we don’t put in the effort we know we should. I am confident that I often fail at that hard work – and occasionally binge on Ice cream to feel better! Although – I will say Ice Cream hasn’t even been in my mind in a few months! I am confident that I have a new determined focus to succeed – because if I don’t take care of me, who will? With a new year- many think of things they want to change. Personally, those changes have been happening for over a month now! Research and classes for my business, re-joined the gym and I actually go, planner organization has begun, podcasts full of inspirational speakers, and building a community around me to help me succeed. Even doing any of that has been a huge step for me. I questioned a lot of the steps I make and got stuck in something my friend calls – Analysis Paralysis. I spent so much time analyzing that I didn’t spend a lot of time doing. Every step of every process was over analyzed, and underdone. Going for a simple run became needing my water, shoes, outfit, music, and running plan perfectly paired. If one thing got off, I froze. I cannot say what the exact cure for my analysis paralysis was, but some of it came from a big dose of reality a coach gave me. 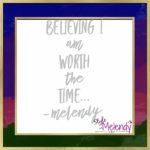 “Melendy – the only person keeping you from being successful is you…” I knew the truth, but I hadn’t heard the voice. I knew it was me – I knew I needed a mindset shift, but – I hadn’t heard it. The only thing keeping me from running – was me. 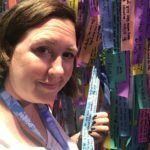 What was keeping me from growing my business?Me! The only one standing in the way of my happiness – you guessed it – ME! I spent a very long time trying to be perfect. In whose eyes? I don’t know. I felt like I couldn’t go out of the house without the perfect outfit, couldn’t ‘go live’ without makeup, silence, a perception of everything is okay. therefore – I froze. Guess what – Everything isn’t always okay. I know, Shocker! I am learning to live in the chaos of life, and be willing to step out of my “perfect” comfort zone. 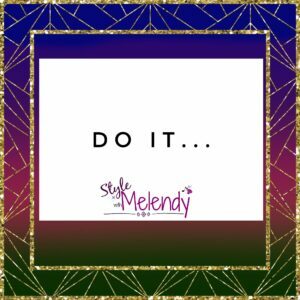 Shifting my mindset to a “Do it” model, and subsequently pushing myself into the work that is going to drive me forward has been a huge boost for me. Scheduling my time, being intentional about my actions, believing I am worthy of the time, and believing others are worthy of my time as well has created an amazing arc in my attitude, and the enjoyment of the day to day! What do you need a mindset shift about? Do you want someone to hold you accountable? Are you ready to take the next step to work hard for the change you want to make? If you are – leave a comment so that I can help you redirect you mindset and grow into you! In 2018 – I am looking forward to using my word (or rather, phrase) for the year, and it starts today. My phrase is “Do it”. Over the last year I have developed this blog with the help of others. I have built my business to a point where Steve and I will enjoy the LuLaRoe Cruise in February. Challenged myself to step out of my comfort zone on many occasions, met new people. I learned a new instrument, began a running regiment that I have mostly maintained, and accepted that my weight loss journey is going to be one that takes more than a few trips to the gym and an occasional salad. I have done a lot in the last year that I would have never done, but I still held back. 1-Do I WANT to do it? If I don’t want to do it, I won’t do it. 2-Is this beneficial to me, my family, others, or my business? If I spend my time doing things that aren’t beneficial, I wont feel fulfilled, and I will stop doing those things. 3-Am I willing to commit the (time/talent/energy/focus) that this adventure/project/training/group deserves? I do not want to commit to something and be half in. I want to be all in, Otherwise, I am not giving my best, and that isn’t how I want to be known. So, I took some time, and I researched some motivational quotes to help me through this new year. Each one spoke to me for a different reason, but the resounding theme was the same – DO IT! I intend to print them and post them in my office space, I want to see the visual reminders of what I intend to do this year. Let’s discuss each for a moment! 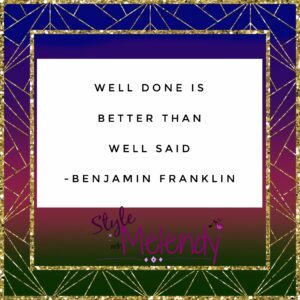 “Well done is better than well said.” Benjamin Franklin – How true is it that your actions speak way louder than your words. I would much rather be known for what I DO and how you feel around me than for what I said – or someone said I said. I want to be intentional with my actions this year! 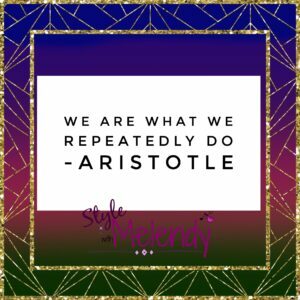 “We are what we repeatedly do.” Aristotle. Habits take 21 days to create – and can be broken in the same. If I am not repeatedly doing the things I want to do to better myself, my business, or my family, then they aren’t going to become a habit. being intentional about my actions will create the habits I want to form! 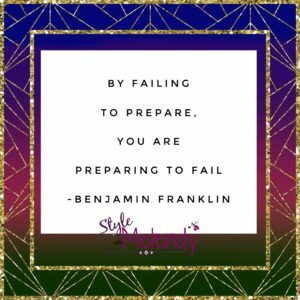 “By Failing to prepare, you are preparing to fail” – Benjamin Franklin. Setting forth a plan of action, and doing my best research, due diligence, and preparation means that I have a better chance of being successful. Often times I am either 9 million hours of planning and no action, or zero planning and failed action. My intention is to find balance between those lines to create more intentional and better actions. 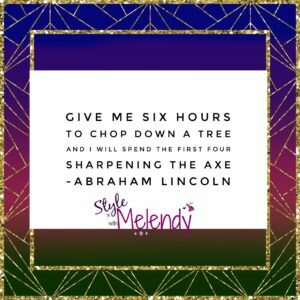 “Give me six hours to chop down a tree and I will spend the first four Sharpening the Axe.” Abraham Lincoln. preparation is good – bust focused attention to the best tools for the task at hand only makes the job easier. Sometimes it is easy to dive forward and want to just do, but I need to remember that proper preparation, planning, and use of my tool box will create an easier job in the long run. 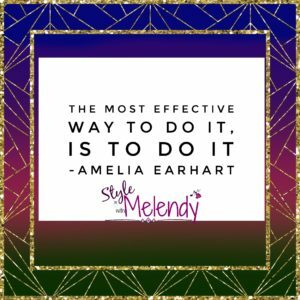 “The most effective way to do it, is to do it.” – Amelia Earhart. I have been focused on my actions. Writing intentionally, scheduling posts so that I am ready for the day ahead, following up with friends, family, group members whom I know I need to follow up with. Setting up a plan for the future. All the planning in the world won’t make it happen. Only actions can do that! And finally, My word/phrase for 2108 – ready for me to not let fear take a hold. Ready to dive in. My original graphic has the phrase – ‘Fear is the Thief of dreams’. I love that subtitle because- it is true! Being afraid causes us to pause, to freeze, to not do. So, in order to rise, to grow, to cultivate my new me, my new business goals, my new dreams, I need to let go of fear – And – DO IT! So, What are you doing this year? What are you looking forward to with hope. How do you want 2018 to end? In order to know our path, we need to know our destination. Follow me here as I dive into this year of doing more, and worrying less. Are you with me? Share your word/goals for this year so that we can move forward together! Today is the start of week 7 with my running coach – Week 7! They say it takes 21 days to form a new habit – or to become adjusted to a new routine. It took me 7 weeks – but running 3-4 times a week, this was my 21st run. “Big Girl” shoes, grabbed my headphones, my playlist, my water, and my running plan. 21 times I did it. Minute seven – one to go, that wasn’t so bad! Minute eight – maybe I could have done 10! and then there was the rest of the ladder. But I ran for 8 minutes. When I started this program 21 runs ago, I couldn’t run for one minute straight. My progress may seem slow, but to me, it is exactly what I needed to do. my body is slowly changing, my waistline getting a little more definition, my abs a little tighter, loosing some of the roundness in my face. 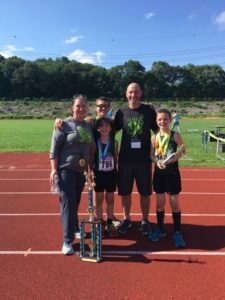 All things I was lacking before I started running. I am so grateful that one Saturday morning my now coach took a chance and asked if I wanted to train with her. She asked if I wanted some guidance in my running. She led with value, and offered me the ability to find myself at my own pace. She sends reminders when it has been too long since I have run, and rejoices in my triumphs when I overcome an obstacle. There are so many excuses I could have made – so many things I could have let get in the way yet 21 times I said yes, and today I rejoice in 8 minutes! Maybe tomorrow I will do 10. What do you want to make a new habit? What are the excuses you tell yourself? Go do it! Make that change for you! Let me be your inspiration – and you go be mine! When you were a child do you remember getting a sticker on your paper? Or a smiley face drawn on by the teacher? How did you feel? You were proud! As we get older, we are taught to be humble, to be kind, and not to boast. Is it truly boasting though if you are doing something that makes you feel good? Steve and I had the experience of coaching some amazing athletes at track and field this season. It is always pride filing to watch these youth go from fear to belief in themselves. We give them the tools to do what they have the physical ability to do, and they soar. Several of our athletes qualify for the National level of the Junior Olympics this year, and it was humbling. The biggest thing we did as a team was to win a local meet. This meet is regional and teams from all over the area come to compete. It was exciting to watch our athletes reach PR’s, do things they hadn’t before, and be proud of their work! 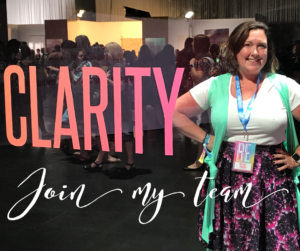 In our day to day life – we work our LuLaRoe business together. We are having much success, and enjoy the work that we do. Why is it that I have a hard time talking about this success? I want others to know that this woman who disliked everything about herself a year ago has found out how to love herself because of the work she is doing with LuLaRoe. I found myself “Turtleing” when people ask what I do, or how it is going. You know – when you pull your head into your neck and round your shoulders. I don’t do that anymore – or at least I try not to. It turns out that the sales figures I have, and the work I am doing puts me in the top 1% of the company. I didn’t know that, I assumed I was average, I assumed others were doing it the same or better. you know what they say about assumptions. I was setting personal PR’s, but I was also creating a sustainable business and keeping it to myself. That helps no one! Today I am making a change. I am choosing to be proud of the work I am doing, and to share that with others. Someone else could benefit from my success story, and I don’t want to take that away from them. So I will share. I will tell people about my success, and what the benefit is for my family, because I can do this, and stay humble, and possibly change a life all at the same time. What can you share? How could it help someone else? Will you share? Who are Melendy and Steve? Melendy and Steve welcome you! I want to take a moment to welcome you to my blog, well, our blog. My name is Melendy, (Muh-LEN-dee) and I am a wife, a mom, a LuLaRoe retailer, a Thirty-One gifts distributor, and a track coach. My husband Stephen is my partner in life and business. He knows computers (but not the one on your desk) and swimming and running, He also is a huge OCR (Obstacle Course Race) fan! 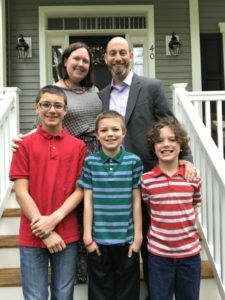 This blog will be a place where we share with you our lives, our journey, and all of the fun we have together. You will find business tips, healthy recipes, race highlights, and all the fashion I wear along the way! ~We have three boys – Caleb, Logan, and Aaron who keep us busy! ~Disney is a place that we travel to a lot, but mostly to relax by the pools! ~Melendy knows some American Sign Language – Steve knows HTML – both Greek to each other! ~we cant wait to get to know you! Thanks for Choosing to follow along with us on this journey! Life is a journey! Melendy and Steve are so excited to open our hearts and our home to you. 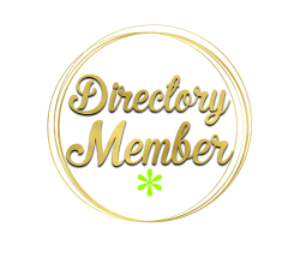 We hope you will find a resource here for growth, humor, love, and fashion! Join us on our parenting, health, fitness and fashion journey as we manage our family, and our business! get information about sales, specials, and more!